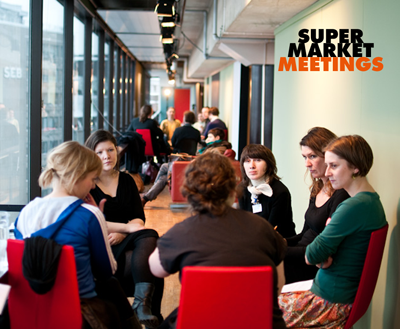 SUPERMARKET MEETINGS programme is an internal programme that allows the exhibitors, participating artists, exhibition organisers, project managers, curators and other professionals to meet each other and discuss various issues surrounding their gallery within an international context. The format is that of small groups of 5–8 people with a preselected topic. The aim is to provide an opportunity to exchange ideas, compare experiences and discuss issues related to self-organised projects. During MEETINGS, the participants discuss their strategies and challenges, as well as develop and re-think contemporary art practices. Meetings like these are core to the actual discussion and planning of future collaborations. Since the importance of establishing interpersonal relations between art professionals is fundamental we hope that these meetings will plant the seeds of new international collaborations. Supermarket MEETINGS are by invitation only and not open to the public; however, we are happy to answer any questions you might have about them!